When I was 22 and everyone I knew was starting to think in a very serious way about their futures and their jobs, I went to Iona as a volunteer for six weeks. Six weeks turned into a year and a half, and besides being Abbey housekeeper I became a d.j., was allowed to drive the ferry (once), and had a fairly riotous time. Every cove and corner of that island had a song, and there were people on the island who could sing them all. While living there I met and worked with people from all over the world and from all walks of life. Being on that island introduced me to a radical democracy, a way of being that allowed for parity between all people and all things. A revolutionary way of seeing and being that had justice and love at its heart. I guess these things are still my guiding principles. After working for Glasgow Association for Mental Health and the Richmond Fellowship in Glasgow, I moved back south to do an MA in Creative Writing. For the past twenty years I’ve been a self-employed poet and have been lucky enough to do some fantastic residencies and collaborations with other artists. 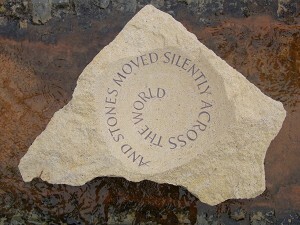 I run an international poetry-as-public-art project, The Migration Habits of Stones, which involves siting stones in different parts of the world with words carved into them. They all say the same thing: and they’re all rooted in the awareness that the very materiality of our world, i.e. rocks and stones, are alive and moving albeit in a very different time frame. My latest book of poems has just come out – Suddenly Everything (Poetry Salzburg) – and I’m currently meandering my way around the idea of writing a book about migrating stones. I completed a practice-based PhD a couple of years ago in poetry and particularly looked at what I called Geographical Intimacy. I love writing and am rather hopeless at finding a balance between the writing life and the more pragmatic life that needs to accompany it. And so I stumble from one wonderful thing to the next and sometimes fall over. I spent some studying Butoh last year ( a Japanese form of dance), and they have a way of seeing that they describe as looking from a frog’s eye point of view. This appeals to me. They also carry the dead with them wherever they go. Remembering those who have gone before. Geopoetics helps me to navigate my way through the world. It shines light on my relationships with the land I walk on, the land I live on, and it offers up a way of understanding myself in relation to everything around me. In particular, I am taken with the idea of intellectual nomadism and also the expansive, boundary-crossing vision of being a citizen of the world. That excites me. It lifts me out of a small place and lets me breathe again, lets me glimpse a bigger picture. 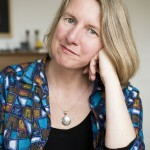 My website can be found at: www.thestonelibrary.com.